Complementary and integrative medicine (CIM) has become big business internationally, in particular with regards to a range of women’s health issues. With this context in mind, Women's Health and Complementary and Integrative Medicine constitutes a valuable and timely resource for those looking to understand, initiate and expand CIM research and evidence-based debate with regards to a wide range of women’s health care issues. The collection brings together leading international CIM researchers from Australia, the USA, the UK, Germany and Canada, with backgrounds and expertise in health social science, statistics, qualitative methodology, clinial trial design, clinical pharmacology, health services research and public health. Contributors draw upon their own CIM research work and experience to explain and review core research and practice issues pertinent to the contemporary field of CIM and its future development with regards to women’s health. 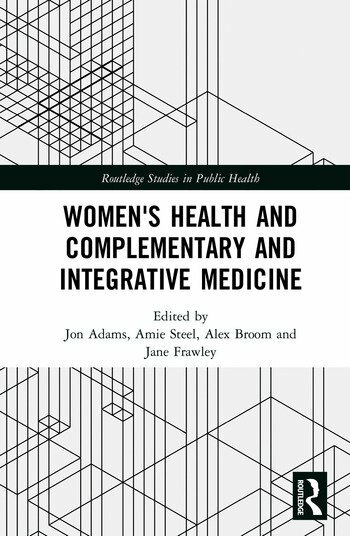 The book outlines the core issues, challenges and opportunities facing the CIM-women’s health field and its study and will provide insight and inspiration for those practising, studying and/or researching the contemporary relations between CIM and women’s health and health care. 1. The role of complementary and integrative medicine within preconception care: contributing to an emerging research field. 6. The use of self-care practices and products by women with chronic illness: a case study of older women with osteoarthritis and osteoporosis. Jon Adams is Distinguished Professor of Public Health, ARC Professorial Fellow and Director, Australian Research Centre in Complementary and Integrative Medicine (ARCCIM), University of Technology Sydney, Australia. Amie Steel is Postdoctoral Research Fellow, Australian Research Centre in Complementary and Integrative Medicine (ARCCIM), University of Technology Sydney, Australia, and Associate Director of Research, Endeavour College of Natural Health, Australia. Alex Broom is Professor of Sociology, University of New South Wales, Australia, and a Visiting Professor, Australian Research Centre in Complementary and Integrative Medicine (ARCCIM), University of Technology Sydney, Australia. Jane Frawley is an NHMRC Early Career Fellow and Research Fellow, Australian Research Centre in Complementary and Integrative Medicine (ARCCIM), University of Technology Sydney, Australia.